There are no rules for how to have these conversations, only that you take the first step to do so. They are an opportunity to reflect on the past, and plan for the future. Kick-starting a conversation doesn’t have to be a one-time occurrence. It can be the beginning of many talks whereby you can openly discuss any number of things – from reflecting on the past to planning for the future. Each conversation is an investment in the future. There are no formal instructions on how to use either of the card decks – however, here are some tips that may help you to get started. It can be as simple as gathering the family around the coffee table with either set of cards, open them up and try the first 3 or 4 questions from the top of the deck, to get the conversation flowing. Sometimes discussing family photos or treasured items can bring memories flooding back and start a conversation. The conversation should feel relaxed and natural, so if you mention a topic that your loved one is uncomfortable discussing, respect their wishes and move on. Some people may need a little more time to think, so be patient. You don’t have to steer the conversation..just let it happen. During the conversation, they may wish to discuss something they have never shared before, or that you hadn’t thought to ask them. Be a good listener with an open mind and heart, and avoid passing judgement. Remember…nothing is set in stone. You and your loved ones can change your minds as circumstances change. You can record the answers to the questions in our downloadable companion booklets, ‘My Life Journal’ and ‘Memo of Wishes’. You may also wish to make an audio or video recording of the conversations. Choose whatever method best suits your family situation, and feels the most comfortable for everyone. This card deck of questions is all about getting your loved one to talk about their life journey in more detail – sharing memories, anecdotes, funny stories, achievements and disappointments etc. It starts with where and when they were born, early school years, the neighbourhood in which they grew up, their first job, major influences on their life choices, through to how they would wish to be remembered. Everyone has a life story to tell, and these conversations should be both a celebration of their life journey and achievements, and a sharing of their disappointments and the hurdles they faced along the way. This is a wonderful way to create a family keepsake which can be handed down from generation to generation. Simply place the card deck on a table and turn them up one at a time, in the order that they appear – straight out of the box. Shuffle the cards well first, then place them on the table – the cards are numbered, so that recording the corresponding responses in our downloadable ‘Your Life Journal’ booklet is easy. Spread the cards out with the image facing up across the table, and let your loved one randomly select which card to pick up next. These cards are designed to start a conversation about the many important decisions that may need to be made during life’s journey, including the end of life stages. Discussing your loved one’s wishes will be helpful in the future, so it is important to record the answers to these questions by using our free downloadable companion booklet ‘Memo of Wishes’, and keeping this booklet with your other important documents. Consider making copies to give to those persons nominated in your Medical Power of Attorney and Will. You may also wish to make an audio or video recording of the conversations. The question cards straight ‘out-of-the-box’, have been ordered according to the above life topics, and provide a more structured way to conduct these sometimes challenging conversations. As a result, we would recommend simply using the cards in the same order as they present themselves when taken out of the box. Your Life Talks – Conversation Starter Cards are a great way to bring groups together for engaging and enjoyable events discussing the topics of their life’s journey and end of life wishes. To kick-start conversations and make your group sessions truly interactive, ask your convenor to pass out 4 or 5 pre-selected cards to group participants. Then one at a time, ask them to read the question on their card out aloud to the group and then share their answer. Ask other group members to join the conversation and discuss their thoughts with the rest of the group, before moving onto the next group member with a card. By having a card in their hands, it gives the card holder the (psychological) ‘permission to speak’ – to both ask the question, and to add their thoughts in response as well. The simple subconscious ‘power’ of this cannot be overstated. You will also find that the other participants very quickly become involved in discussions about the things that matter most to them. Conversations will start to flow. 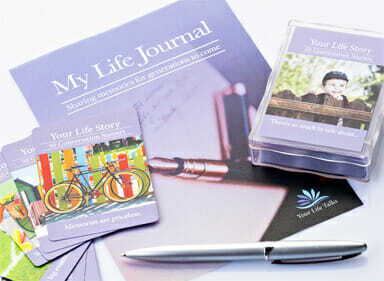 Everyone has a story to tell, so it’s a good idea to start with cards from the ‘Your Life Story’ deck. Recalling their fondest memories and life experiences can be lots of fun. The group will enjoy discovering stories from each other’s childhoods and hearing about their early adult lives, and the adventures and anecdotes along the way. Are you named after anyone? Do you have a nickname, and how did it come about? During your childhood, what did you want to be when you grew up…and why? Thinking of all your accomplishments, of which are you most proud? Tell me 3 words that best describe you. It is a natural progression after reflecting on their life’s journey to talk about their future plans. ‘Your Life Wishes’ card deck helps to ‘break the ice’ on talking about, sometimes more difficult topics, such as health and medical care issues, making a Will & Power of Attorney and preferred funeral arrangements and memorialisation. Do you have a strong preference regarding your accommodation choices as you get older? Would you want to be informed of your life expectancy, if you are terminally ill? Under what circumstances (if any), would you not want to continue on life support? Do you wish to donate your organs/body, and if so, where is your consenting documentation located? If cremated, what would you wish to be done with your ashes? Eg stored in an urn, wall niche, scattered or buried? There are 50 questions in each of the Conversation Starter card decks, so they can be used at group sessions over a period of time, to encourage ongoing discussions. Community and Carer Support Groups that have used the Conversation Starter Cards at their meetings have reported that the experience was a positive and rewarding activity for everyone involved. Many group members are inspired to continue the conversation after the event with their own families and friends, and to take important steps in initiating their own advance care planning.